The day team, who are out every Tuesday and Thursday, year round, regardless of the weather: Sue Hirst, Ange and Pete Morrissey, Frances Collinson, Mike Kniveton, Kirsty Taylor, Janet Hedley, Emma Thomas, Dee Buss and Alan Simcock. The Tetbury Town Council grounds staff, Les Triggs, David Thompson and Colin Woodward, who keep the grass mowed and the town looking so well manicured. Sue Bailey, our Town Clerk, who helped to judge the local garden competition. Christine and Barry Gibbs, Ange and Pete Morrissey, Frances and Tom O’Brien, Julie and Alan Simcock, Cordy and Trevor Snell, Sue and Jeremy Townsend, Lise and Chris White and Pauline and Charles Whittaker for opening their beautiful gardens to the public; an event which has proved so successful that it has become an annual event in the Tetbury diary – please make a note of next year’s date, Sunday 24th June. My Mum, Rachel O’Brien (no relation to Frances and Tom) for baking the cakes, Stephen Hirst for supplying more cakes as raffle prizes, and to Chris Gibson and the ladies of the Women’s Institute for helping to serve them. Jackie Wheels, Elizabeth Sykes and Celestine Bridgeman, from the Oxford Wine Company, for organising another entertaining wine tasting evening. Richard Glanville and the Cotswold Wardens, together with children and parents from Saint Mary’s Primary School and Sir William Romney’s, who assisted us in the planting of over 120 saplings to mark the launch of Britain in Bloom 2011. Kate Thompson and the pupils of Saint Mary’s Primary School for another stunning mural, which captured, beautifully, the town of Tetbury and the “in bloom” theme. Builders Ede Ltd, who kindly donated the boards for the third year running. The new owners of 44 Long Street, for enabling us to have a summer exhibition of photographs in the town. The Art Gallery, Long Street, for framing and displaying the picture of the mural. The many businesses who dressed their shop window displays so cleverly, to coincide with the Britain in Bloom judging. Derek Jackson, the Mayor Rob McCorkell, other town dignitaries, including the members of the Women’s Institute, for welcoming the judges to Tetbury, thereby demonstrating the enormous levels of support we receive. The residents of Cookspool who worked so very hard to ensure that their gardens were immaculate for the judge’s visit and Monica Clark, Princess Capener, Barbara Ball, Jeremy Townsend, Theo Martin and Emilia Thomas, Elizabeth Sykes and The Rev Canon John Wright, who met the judges along the route. Pam Bird, Di Bryan, Peter Lisle-Taylor, Ken Jones, Basil Mason Smith, Roger Gibson and Bill Buss, who were up early and keeping one step ahead of the judges, ensuring that no odd bits of litter were left lying around. Kevin Farnham (my husband) for his beautiful photographs. The Cubs, Scouts, Guides and the many volunteers who helped us to sweep the streets – between us we collected an impressive 4.4 tons of debris! Scott Williams and Andrew Woropaj of CDC, who arranged for the collection and disposal of the waste, and to Tetbury Fire station for allowing us to store the bins in their yard. The Feoffees and John Latter for helping us to create the wildflower meadow alongside Cutwell ford – a particular favourite with passersby, who can regularly be seen taking photographs and consulting the display boards. The Women’s Institute for including us in their plans to commemorate the marriage of TRH the Duke and Duchess of Cambridge. John Newman of Jesse Smith Butchers for providing the burgers and hot dogs at our November Dog Racing evening; Colin Poole and Paul Stead for cooking the food; the businesses who sponsored the races and those of you who joined in another fun evening. Ken White for his help with fund raising and, of course, our donors and supporters, including: Tetbury Town Council, Tetbury Upton Parish Council, the Lions Club of Tetbury, The Feoffees of Tetbury, Tetbury and Cirencester Civic Societies, the Rotary Club of the South Cotswolds, Saint Mary’s Parochial Church Council, Anglian Home Improvements, Gloucester Market Towns Forum, IHS Energy, the Woolsack Committee, Xograph, Perry Bishop and Chambers, The Tetbury Tailor, The Tetbury Pot, The Highgrove Shop, Tesco, Edward Blake Ltd, Jesse Smiths, Moloh, Boho, Overider, The Chambers of Commerce and Industry, Hobbs House Bakery, Jester Antiques, Artique, Tetbury Audi, Clark and Maslin, Jewson, Eagle Plant and the Tetbury Camera Club. Heron Bellhouse, the owner of Chipping Court, who kindly installed an outside tap to assist us in the huge job of watering the baskets. Everyone who bought hanging baskets from us or who attended our fund raising events. Until next year .... A very Merry Christmas and a Happy New Year to you all from the Tetbury in Bloom Committee: Sue, Mel, Ange, Stephen, Ian, Pete, Kevin and me. I am pleased to be able to report that we were awarded our second Silver Gilt award in the Britain in Bloom finals, narrowly missing out on a Gold! Thank you and congratulations to everyone involved. The overall Small Town winner was Saint Martin, Guernsey, who won the only Gold in our category. Nearby Thornbury and Bristol won Gold in the Town and City categories respectively. Bath won Silver Gilt in the Small City Category and Upton upon Severn won Silver in the Large Village Category. Cricklade won Gold and were pronounced overall Champion of Champions 2011 in their category, in recognition of their consistently high track record – well done to them all. We all had a lovely evening at the awards ceremony in the grand setting of the Fairmont Hotel, Saint Andrews. The Upton upon Severn “Bloomers” drove the whole way, there and back, in a day! Since we were paying for the trip ourselves we decided to make a long weekend of it and had a lovely time exploring Fife. Best of all have been the wonderful comments and the messages of support we have received from so many of you. Carolyn Witcher of Northfield Road summed Tetbury’s in Bloom campaign up so very well ... on nights when the television news was full of riots across the country, the people of Tetbury were out sweeping the streets and helping to make our town such a wonderful place to live! The hard work continues. We are preparing the flowerbeds for the winter and planting more spring bulbs. Also, our fund raising activities continue. At the time of writing this article tickets were still available for the “Hot Night at the Dogs” race night on Saturday 19th November in the Dolphins Hall. Included in the £5.00 ticket price are light refreshments and entry into a draw to win a bottle of champagne. Hot dogs and burgers, kindly donated by Jessie Smith Butchers, will also be on sale. All monies raised go to Tetbury in Bloom projects and next year’s floral displays. To obtain your ticket, contact Sue Hirst on 504213. At the time of writing this article we have yet to learn the results of the Britain in Bloom competition. For that Sue, Mel, Stephen, Ian, Kevin and I must travel to St Andrews for the Awards Ceremony on 25th September. All will be revealed at our own Prize Giving evening in the Dolphins Hall on 30th September! I can, however, announce the results of the Local Garden and the Shop Window Display competitions. The Local Garden competition took place during the weekend of 9th and 10th July and the shop window displays were judged on the afternoon of 8th August, to coincide with judging of Britain in Bloom. The standard was very high again this year. Well done to everyone who entered. Once again, thank you to Ali and George Bristow of “Artique” who donated the commemorative brass plaques, given to each of the category winners. We did not hold a children’s painting competition this year. Instead we asked pupils from Saint Mary’s to paint town landmarks and flowers and Kev (my husband) and Kate Thompson turned them into the design for the amazing mural that is currently displayed at the Matbro site on London Road. Because there was not room for all the beautiful pictures on the mural, others were turned into posters to advertise the judging date for Britain in Bloom, which you may also have seen those displayed around the town. What a talented lot you all are and what a beautiful addition the mural makes to the town. Thank you and well done to you all. The hard work and fund raising continues. On 19th November we will be holding another Race Night – “A Hot Night at the Dogs”. Thank you to John Newman of Jessie Smith Butchers for sponsoring the event and to Colin Poole and Paul Stead for agreeing to cook the burgers and hot dogs. Given the success of the horse racing night earlier in the year it should be a wonderful evening. To obtain your ticket, contact Sue Hirst on 504213. We look forward to seeing you there. As I complete this article on the 10th August, the RHS judges Rae Beckwith (former Area Manager for Gateshead Council for 20 years and, himself, seven-times finalist in Britain in Bloom) and Sharon Thomas (involved in East Midlands in Bloom and Landscape Development Manager for Amber Valley Borough Council) are on their way to judge another town. Everyone who came out, night after night, to help sweep the entire route, twice! A special mention to Christian and Max for all their assistance and enthusiasm – on some evenings we had over twenty helpers out and on one evening the age range spanned nearly eighty years! Those of you who were out and about from 5:45am this morning and who patrolled the route putting the final polish on things! The management and staff of the Close Hotel who put themselves out to serve us lunch at 11 o’clock! The judges were impressed by the levels of community support but “did not give anything away”. We must now wait until 25th September to be given the results. Our thoughts and best wishes go to the Dunnington team in North Yorkshire who, on the morning of their judging, suffered a devastating storm which felled trees and brought floods. It has been a busy summer for us in many other ways. The Open Gardens Day, held on the 28th June, was another great success. The sun shone bringing visitors out in force. Our sincerest thanks go to: Christine and Barry Gibbs, Frances and Tom O’Brien, Julie and Alan Simcock, Cordy and Trevor Snell, Sue and Jeremy Townsend, Pauline and Charles Whittaker and Lise and Chris White for opening their gardens to the public and for the warm welcome given; to the ladies of the Women’s Institute and Pete Morrissey for running the Cutwell Cafe; and to Rachel (my Mum) and Stephen Hirst for the delicious homemade cakes. Congratulations to Janet Hedley and Peter Martin for winning the raffle. Judging of the local garden competition took place over the weekend of the 9th and 10th July. Thank you to the Town Clerk, Sue Bailey, for her support with the judging and for giving up her weekend. It was lovely to receive so many new entries and, as usual, the standard was very high. I will announce the results in next month’s article. Kev and I went on the wonderful visit to Highclere Castle, arranged so expertly by the Civic Society. Thank you to the Civic Society for their donation. We held an exhibition in the newly renovated Old Doctor’s Surgery, Long Street. Thank you to the new owners for suggesting the idea and for so whole heartedly getting behind Tetbury in Bloom. And, on 13th July we unveiled the spectacular mural designed and painted by pupils of Saint Mary’s Primary School, with support from Kate Thompson. This artwork makes a wonderful addition to the town. Well done to everyone involved. I am delighted to be able to report that, at last, we have been advised by the RHS of the date that Tetbury will be judged as part of the 2011 Britain in Bloom campaign. The date for your diaries is the morning of Wednesday 10th August. Please do come along to the Market Hall to meet the judges - your presence will demonstrate just how much the community of Tetbury supports the campaign, and this really will make all the difference to how well we fair in the competition, with one quarter of the points allocated to “Community Participation”. The Market Hall will be open from 10.15am. Light refreshments will be available. There will also be an opportunity to view an exhibition of the work carried out by Tetbury in Bloom over the past seven years. We look forward to seeing you there. Very many thanks go to the Feoffees for allowing us to use the Market Hall; members of the Tetbury Evening Women’s Institute, who will be on hand to serve the refreshments; the camera club for the loan of the display boards and the digital projector; and Derek Jackson, (the Town Crier) for agreeing to welcome the judges in his inimitable style. Also a special thank you to Da-Xia Bessant and the stallholders at the weekly craft fair for kindly agreeing to rearrange their schedule that week, thereby freeing up the Market Hall. The glorious hanging baskets and the floral displays along Long Street. A new mural, designed and painted by the pupils of Saint Mary’s, screening the entrance to the vacant Matbro site – thank you once again to Builders Ede for supplying the boards and for giving us permission to display them. The new wildflower planting along the verges of Cutwell and alongside the ford. The trees on West Street and Brewery Lane car parks, and the award winning flowerbeds outside the public conveniences! Saint Mary’s churchyard, including the “wedding cake” tree, Cornus Controversa Variegata, planted by HRH Duchess of Cornwall to commemorate the royal wedding. The shop window displays along Church Street and the floral displays around the Market Hall. We will then return to the Market Hall to meet the town dignitaries and our supporters and to enjoy a well-earned cup of tea or coffee and a biscuit. Judging of the Tetbury in Bloom shop window display competition will therefore be held at 3pm on Monday 8th August, giving us plenty of time to issue the certificates. Later this month we will be delivering pamphlets to all residents and businesses along the route, confirming the judging time and asking for support in ensuring that the town looks its best on 10th August – please check outside on the morning to remove any litter or weeds and hide unsightly wheelie bins and recycling boxes from view. Such attention to detail really does help and could very well make the difference between a Silver-Gilt award and that coveted Gold that we so narrowly missed out on in 2009! Thank you to Edward Blake Ltd and the Civic Society for their kind donations and to the Woolsack committee for naming us as one of the beneficiaries of Woolsack Day. Finally, to all you clubs and societies out there, remember the Flower Show and the scarecrow competition on Sunday 14th August – we relish the challenge! It is fast approaching the time of year when we turn our thoughts to our local garden competition. The competition is open to all residents and businesses in Tetbury. It is our opportunity to recognise the talents and expertise of local gardeners who help to make Tetbury so beautiful. It is always a pleasure to see what others are doing. This year the competition will be held during the weekend of the 9th and 10th July. As usual, there are nine categories and so I hope that there is something for you all. The deadline for the receipt of entries Friday 1st July and entry is free. To apply, simply complete and return the attached entry form; it is as easy as that! 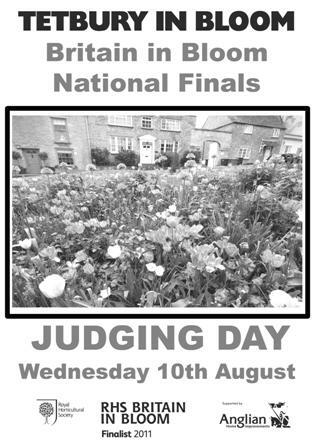 Again this year the competition will be judged by our very own Sue Hirst (Tetbury in Bloom Team Leader); team member and previous winner, Ange Morrissey and Sue Bailey the Town Clerk. Between them they have a wealth of horticultural experience and qualifications, so we are delighted that they are again willing to give up a weekend to support us. Together they will be assessing: visual impact, colour, the variety of plants, general tidiness, well cared for lawns with neat edges (as appropriate), the absence of weeds, environmentally responsible garden practices (such as composting facilities and water butts) and, of course, overall imagination and that thing called “wow factor”. If you haven’t entered before, why not give it a go? We are hugely grateful to former Tetbury in Bloom member Ali Bristow and her husband George of “Artique” who, since 2006, have commissioned and donated the commemorative brass plaques, given to the winners of each category. This year they are celebrating forty years of trading in Tetbury and we wish to offer our congratulations and to thank them very much for their generous support over the years. Also thank you to Tetbury Town Council for their contribution towards plants for the town. Do remember the local Open Gardens Day on 26th June. Different gardens will be open this year – look out for the posters advertising the event and visit us at Woolsack to obtain your ticket in advance. Finally, we were delighted to be asked to judge the shop window display competition to commemorate the Royal Wedding. Didn’t the town look festive? A very well done to everyone who joined in and to those who made 29th April such a wonderful day for us all. Tuesday 3rd May – we are delighted to be working with the WI as they plant a “Wedding Cake tree”, Cornus Controversa Variegata, in Saint Marys, to commemorate the Royal Wedding. What a wonderful legacy and a delightful addition to the churchyard. Monday 30th May – we continue to support the Woolsack Day Street Fair. As usual we will be holding a plant stall and this year we will also be selling bird nesting boxes, made by the students of the Butterfly Garden charity. If you have any unused, serviceable, second hand garden tools, which we could also sell to boost our funds, please let Sue Hirst know on 504213. Otherwise, do seek us out on the day - we would love to see you. Every Tuesday and Thursday evening, from 2nd June until judging day, from 7:30 pm onwards, work parties will be out planting the flowerbeds and troughs with summer bedding, weeding, edging the verges, sweeping the streets and generally “titivating” the judging route. If you are interested in joining in, please contact Sue Hirst on the day to find out where we will be working on a particular evening, on 504213. It is a good way to get some exercise and brings with it great satisfaction. On Thursday 2nd June, we will accept delivery of the summer hanging baskets and the summer season can officially begin! Saturday 9th and Sunday 10th July – we will be holding the annual local garden competition. I will be providing more details in my next article, together with an application form. Between 1st and 12th August the RHS Britain in Bloom judges will be visiting Tetbury. (Unfortunately we have to wait until next month to be told the exact date.) As usual we will be holding an exhibition in the Market Hall, which we hope you can attend to demonstrate to the judges, first-hand, the amazing level of support the campaign receives. 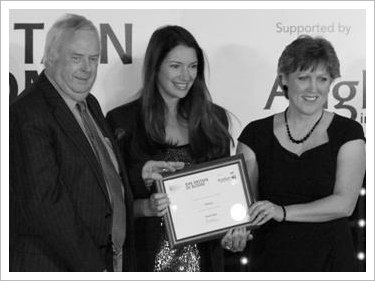 Sunday 25th September 2011 – the RHS will be holding the Britain in Bloom Awards Presentation in St Andrew’s, Scotland. This is when we will discover the results of the judges’ assessment! Friday 30th September 2011 – we will be holding our own Prize Giving evening for winners of the local garden competition and the children’s painting competition. It will also give us an opportunity to thank all our supporters. Our fund raising activities also continue throughout the year. Thank you to the Highgrove Shop, IHS Energy, Tetbury Lions, Tetbury Pot, Tesco, Tetbury Upton Parish Council, and The Rotary Club of the South Cotswolds for their generous donations. Thank you to Jewson for supplying us with more paint with which to spruce-up the street furniture along the judging route. Also, thank you to the Cotswold Volunteer Wardens and pupils of Saint Mary’s and Sir William Romney’s for supporting the tree planting event back in March and the Community Payback Team for their on-going work. A full list of sponsors is on our website at: www.tetburyinbloom.org.uk. I really can’t stress too strongly, the importance of your continued support. Thank you one and all. 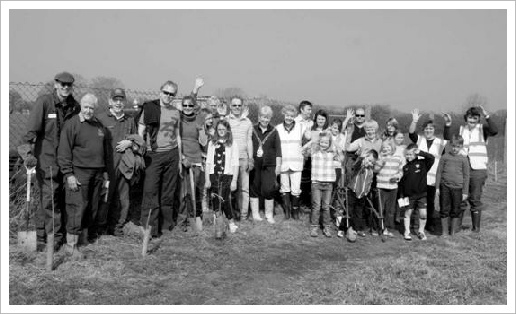 Bloomers, Cotswold Volunteer Wardens and enthusiastic volunteers planted over 110 trees on 26th March. As you know, we have aspirations to win a Gold award in the national Britain in Bloom competition this year. Only 18 Gold medals were awarded in total last year, across all 13 categories and 66 entrants; but we like a challenge. We have previously scored very highly for Horticultural Achievement (which represents 50% of the marks) and Community Participation (a further 25%) and so new projects will, in the main, focus on the area of Environmental Responsibility. This includes such activities as: wildlife habitat, recycling, minimising demand placed on natural resources, the management and development of local heritage, art in the landscape and pride of place. Our principal new project for 2011 will be planting the grassy area alongside the ford at the bottom of Cutwell with wildflowers. A big thank you to the Feoffees (the owners of the land) for their permission and support. With this in mind Sue, Kev and I recently visited the National Wildflower Centre, on the outskirts of Liverpool, for advice from the experts and we also had a visit from David Wassell MBE (former Heart of England in Bloom judge) to talk us through what we need to do to achieve the best results. Weather permitting, an annual wildflower cornfield seed mix should be easy to grow and should result in a spectacular display within 10 to 12 weeks of sowing. We will also be seeking to enhance the wildflower area in the Saint Mary’s and to continue to maintain the more formal displays in the churchyard. We have assisted the Parochial Church Council by installing two more memorial benches and have plans to create a new memorial flowerbed where Canon Michael C.G. Sherwood’s ashes were interred. (He was Vicar at Saint Mary’s between 1961 and 1986) Thank you to the Parochial Church Council for their kind donation towards these projects. Continuing the environmental theme, and following the receipt of a grant from the Gloucestershire Market Town Forum for which we are very grateful, we will be replacing all 21 tubs around the town (Chipping Steps, London Road and the Old Brewery Lane car park) with new, high-tech, self-watering planters. Not only will this make Tetbury in Bloom’s task of watering much easier but, in turn, this should help produce even more spectacular displays, even in the hottest of summers. With the Women’s Institute, we will be doing our bit to celebrate the Royal Wedding by planting a “wedding cake” tree, Cornus Controversa Variegata. With its small creamy-white flowers covering the horizontal branches in May, it will definitely have “wow factor”. Tetbury in Bloom will also be judging the local shop window displays. At the time of writing, with the help of the pupils of both schools and with the support of Steven Mackay (Headmaster) and Cotswold Warden Richard Glanville and his colleagues, we have arranged to plant 105 native-species saplings in the grounds of Sir William Romney’s School. This is to mark the launch of the 2011 Britain in Bloom campaign. The trees were specially chosen to provide habitat and food sources for native wildlife. Can you believe that species such as oak and birch support over ten times as many insects as larch? In addition, they will provide a lasting legacy for generations to come. We have commissioned bird boxes from the Cheltenham-based “The Butterfly Garden” a charity educational gardening and land skills project which supports students with learning difficulties, disabilities and/or behavioural problems. (If you want to find out more, check out their website at www.thebutterflygarden.org.) Some will be given to the Saint Mary’s Garden Club members to erect on our behalf and others will be on sale at Woolsack. We eagerly wait to learn whether they attract any birds this year. We are also pleased to continue to support the Saint Mary’s Garden Club, by purchasing seeds and offering support and advice. This is another great initiative to introduce youngsters to the joys of gardening and the great outdoors. We will also be running another design competition for a new mural on the site at London Road and are delighted that the school wishes to retain last year’s artwork to adorn the infant school. And, finally, we will be holding our second Open Gardens Day on Sunday 26 June. We are hoping to include even more gardens as part of this year’s event. If you would be interested in opening your garden to the public and are at home that weekend, we would be delighted to hear from you. Please contact Ange Morrissey on 505723. Otherwise, it’s another date for the diary. The “Britain in Bloom Gold Cup” race night, held in February, set us off to a great start and raised an impressive £973.68 towards these and all our projects this year! A big thank you to Boho, Hobbs House Bakery, Jester Antiques, John Newman, Moloh, Overider , The Tetbury Tailor and the Chamber of Commerce and Industry for sponsoring the races and to so many of you who came along to show your support. I hope that you enjoyed the evening as much as we did. On 27th January Sue Hirst and I attended the Britain in Bloom seminar in Liverpool, the European Union City of Culture in 2009. It was an opportunity to find out what is expected of us and to meet the judges. We also had a talk from Matthew Pottage (RHS Master of Horticulture) regarding the role of mature trees in the urban landscape and discussed the role of “in Bloom” groups in supporting the “Big Society” initiative, with an estimated 115,000 volunteers donating an estimated 1.7 million hours to the Britain in Bloom campaign alone. Roger Burnett, Chairman, and one of our judges two years ago, asked us to pass on his regards and best wishes for the coming year. He remembers his visit to Tetbury fondly and has high expectations of us! Wareham – three times Gold award winner in the South and South East regional competition. Unfortunately we won’t be told when we will be judged until June and no amount of cajoling can change this! All I can tell you, at this stage, is that it will be sometime during the fortnight between 1st and 13th August. To mark the official launch of the Britain in Bloom 2011 campaign, this year’s theme is tree planting. On 26th March, with the assistance of the Cotswold Wardens and school children, we will be doing our bit to mark the “Big Tree Year”. In December the Government launched a campaign to plant a million trees across England by 2015. The “Big Tree offer” supports this initiative by increasing the number of trees in towns, cities and residential areas across the country. Britain in Bloom has partnered with the Woodland Trust to offer free trees. We have ordered 105 native saplings, a mix of hawthorn, hazel, birch, rowan, oak and blackthorn to create habitat for native wildlife. On 15th April we will be holding a Wine Tasting evening and fund-raising event, in conjunction with the Oxford Wine Company. At the time of writing, tickets have just gone on sale, price £10.00 each. To reserve your tickets please contact Sue Hirst (504213). This will be the third year we have held this event; it has proved both extremely informative and great fun. Do come along and judge for yourself. We are still taking orders for our new ‘ball’-style summer hanging baskets, filled with red, pink, scarlet and apricot trailing begonias. They cost £25 each and will be available from the beginning of June. To reserve your hanging basket, call Sue Hirst on 504213, email her at slee@tecres.net or complete and return the attached order form. All profits go towards funding other Tetbury in Bloom initiatives. Also, the more hanging baskets and floral displays, the more impressive the town will look throughout the summer, not just for judging day itself. In fact, the first of this year’s floral displays should be underway. The snowdrops and cyclamen in Saint Mary’s churchyard in particular should create a wonderful display from February through March; these will be followed by daffodils, primula, tulips and bluebells. Thank you to The Tetbury Tailor, Xograph, Perry Bishop and Chambers and the many kind individuals for their donations. 2011 is a big year for Tetbury in Bloom as we enter the national Britain in Bloom campaign (run by the Royal Horticultural Society) for the second time. As I learned on my Masters in Project and Programme Management, “good project planning is crucial to project success”. Planning ahead is equally important to Tetbury in Bloom. On 17th November last year we met with Les Goodman (former judge with the Heart of England in Bloom) to discuss our plans for 2011 and what we need to do to achieve that elusive gold award. As I write this article, we eagerly await the seminar on 27th January, in Liverpool, when we get to meet the judges and representatives from the other small towns around the country. We have come a long way since 2005 when the new team formed to re-plant the flowerbed on the Knapp, replacing the summer bedding with mixed planting schemes, which now give Tetbury its unique look. But we cannot be complacent. Our floral displays and the impressive levels of community involvement are our main strengths. It has, however, been suggested that, as with the flowerbeds, we initiate a colour scheme for all hanging baskets, particularly those in and around the Market Hall. Also, we need to do more for wildlife and, in particular, create more extensive wildflower areas. Otherwise, we “just” have to maintain the high standard in everything we do! Our new style hanging baskets will create spherical flower displays and be less prone to drying out so quickly. Comprising trailing begonias in red, pink, scarlet and apricot shades they will compliment, perfectly, those on the Market Hall. They are available for residents and businesses to order now, at a price of £25 per basket. Please support us by contacting Sue Hirst on 504213 to reserve your basket as soon as possible to avoid disappointment. We would be delighted to hear from you if you wish to join one of the working parties, helping to turn our plans into reality. There is a lot to do, even at this time of year. You don’t need to be a horticultural expert - instruction will be given! You just need an enthusiasm and to be able to work as part of a team. Sue, Ange and Pete, with help from Kirsty, Frances, Mike and Emma, are out twice a week on Tuesday and Thursday mornings, weather permitting! Also we will shortly be commencing weekend work parties, once a month, to tackle bigger projects. The more people can help, the easier it is and the more fun we have. But we can’t do anything without funding. Whilst we hold our own fund raising events (the Race Night on 26th February; a wine tasting evening on 15th April; the sale of hanging baskets, a plant stall at the Woolsack Day Fair, and an Open Gardens Day in June), Tetbury in Bloom remains reliant on donations and gifts in-kind. Given that we are in the national finals, we estimate that we need to raise £8,000 this year. Thank you to the Feoffees for their generous donation that has set us on our way to achieving this target. If you can help us in any way, do please let us know by contacting Sue Hirst on 504213. Remember, every penny raised goes towards Tetbury in Bloom projects, which benefit the whole town.